I set out a note for the girls to do some school stuff, Hannah was packed and Bethany was dropping her off at church at 4pm to leave for camp – I was heading downtown with my Schnooke for breakfast at Snooze and then to an all day teacher training event at the History Colorado museum and the American West museum. Only a few of the teachers there knew we (there were two other ladies from my HS group there) were homeschoolers, but they were cool with it. We learned about the resources the museum has, field trips, docent tours, on-line archives, hands-on materials and then took a tour of the new Backstory exhibit which has DAM Western art and History Colorado artifacts paired to tell a story. The pieces were pretty amazing, much better in person, but here are a few things. Alfred Miller, Shoshone Indians at a Mountain Lake. This painting is so tranquil and I love the way the tree and cliff are boundaries for your eyes that bring them back to the center of water and mountains. Civil War drum and drumsticks. This is from a NY regiment. Albert Bierstadt, Estes Park Long’s Peak. This picture is huge, it’s of the Estes park area. I love the way the light bounces off of the trees and the shadows that are cast. Charles Russell, In the Enemy’s Country. There was a lot of detail in this small painting that you can’t see in the photo. The Indians that are further back are covered in buffalo hides to camouflage them as they trek though enemy territory. Sometimes reading the title of the piece is helpful. E. Irving Couse, Crouching Indian by Fire. I loved the brush strokes and color in this one. W. Herbert Dunton, Black Bears. This one reminds me of an Emily Carr painting. Kenneth Adams, Reapers (Harvest). I love the light and the flow of this one. 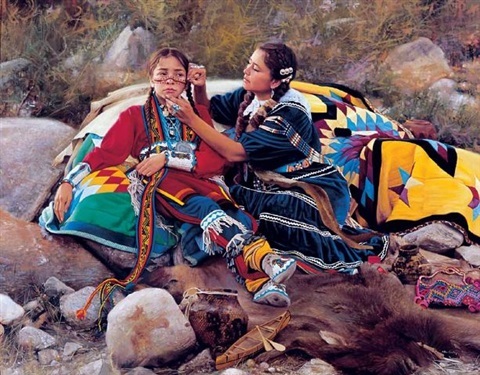 Yes, that is an oil painting. We convened back at the tables and discussed the paintings we had studied, then it was time to go. The American West museum is free for school groups, so I’ll be setting one of those up. The art is just amazing, you could spend hours there. Hannah made it onto the bus just fine, she was a little sad that she didn’t get to say ‘Bye’ in person, but I think she’ll have fun. This morning we went to a lecture on the art and architecture of Rome. The speaker had some good travel tips that will help out. 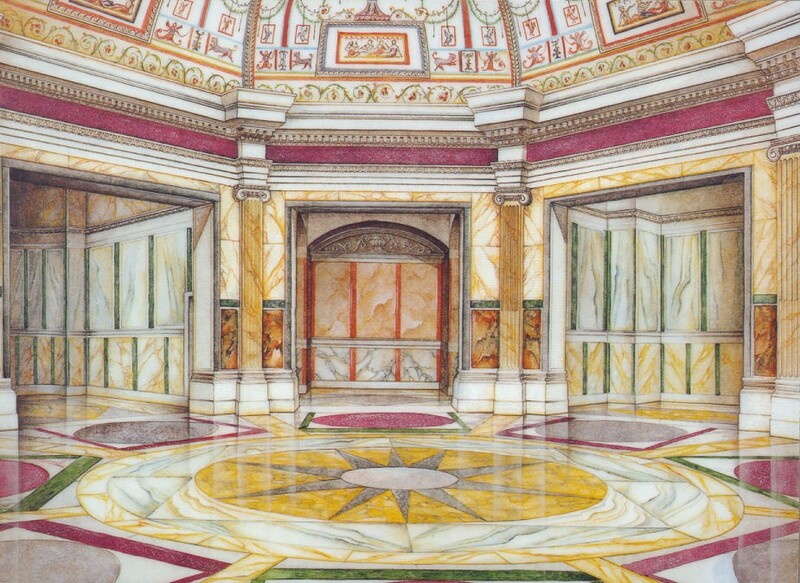 Funny that the library booked a lecture on Rome on the Ides of March – it just happened that way. 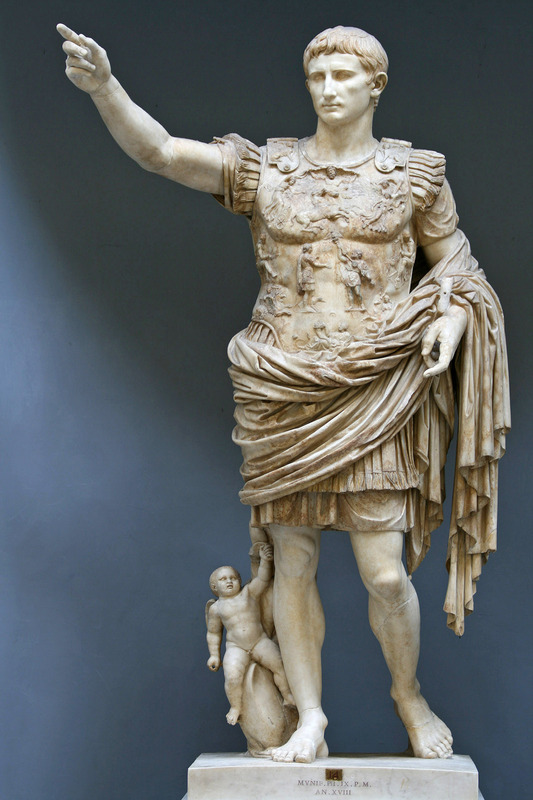 Augustus, the Manly Emperor of Rome who left Rome a shining city of marble. 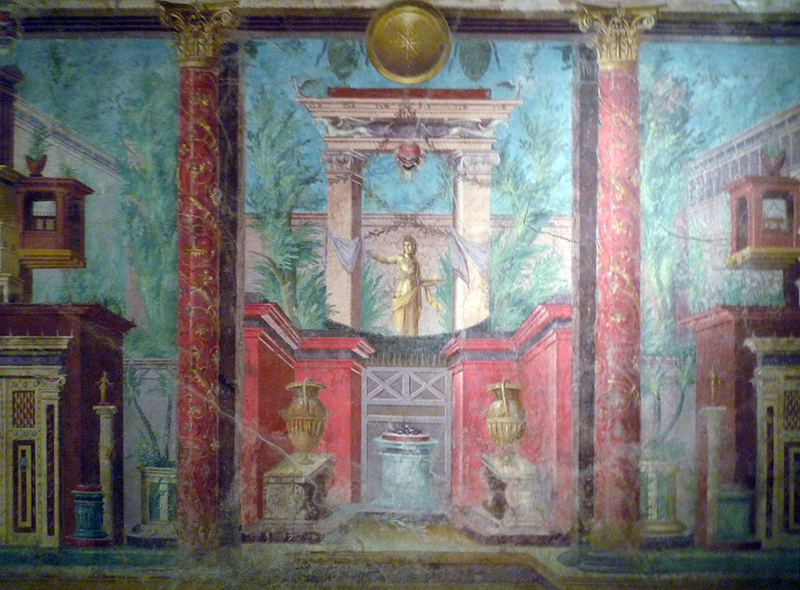 The frescoes of Livia (Augustus’ wife) from her villa, taken out and put in a museum (that we might go to) which are examples of 2nd style art. Frescoes at Pompeii in the 2nd and 3rd styles, I am assuming we will see some of these on our Pompeii stop. Back at home we had lunch, did some school, then headed over to a different library to do printmaking. There were a lot of teens in the room, so the adults sat upstairs and talked. Hannah left her paper, but she made a foam block with her LPS name, a heart and the name of her friend. Here are Bethany’s and Grace’s. Back at home I threw together the quiches and they were done right before I left for TNO. I had a good time chatting at TNO, eating Asian meatballs and drinking root beer, I was really tired though from getting up early going to the gym with Bethany, then going to gym again for NIA. We skipped school this morning and went to Garden of the gods for their first nature/craft/lecture series. It was about magpies, we made a magpie ornament (I learned how to do a blanket stitch) while listening to a lecture on this smart, loud, thieving, amazing nest building bird. But, we like magpies and think they are cool. After lunch we went over to Manitou to play at the arcade. I spent my four quarters taking up the top 4 spots on Galaga (MOM). Hannah spent all her nickels on the basketball game. We played pinball, shooting gallery games, more arcade games and then the girls went by the candy store to get some treats. Dinner was in the crockpot at home, tonight was BBQ pork sliders. The rest of the week – chicken tortilla soup, stuffed bell peppers, apricot chicken and sweet potato and chorizo lasagna. Tomorrow, more fun and games. This morning we did school, Bethany worked on an English paper, did anatomy and medical terminology (the tests are still very long at 75 questions, but the rest of the work is more manageable now) and wrote about censorship and ethics for journalism. Hannah went down her list for math (using variable to solve equations), literature (reading From the Mixed Up Files of Mrs. Basil E. Frankweiler), history, spelling, grammar, vocabulary and writing. Grace took a test in IT, a test in English, did a section on polynomials in math (because her unit test is locked until Thursday, so she just went into the next chapter), took an earth science test and a government test…not sure why she landed on so many tests today. After lunch we went to the library for a lecture on The Manhattan Project by a man who worked at the Oak Ridge lab for the project. The girls were disappointed because they thought he was going to talk more about his role, he spent very little time on that and instead gave an overview of the project, details about the bombs, who was involved, why we did it and the current state of nuclear arms. When we got home I found this site that has transcripts of interviews done in the 80’s with him, so if you want to know his background and what he did go read it (he talks about a lot of things, not just the project, it’s funny how he brags on his kids.) We used this site and also this one to find out more information about the Manhattan Project. None of the girls are studying this right now, but when it comes up (again for some of them) they can put his talk and the information into use. Bethany could use it for journalism (ethics), Grace is working on government so she could use the information to look at how the government goes about working on projects during war and of course the decision to drop nuclear bombs on people. Hannah is way back in the beginning of US history right now, but WWII will come soon enough. Things that you go to don’t have to be related to what you are studying at this moment, it’s always good to have random things tucked away in your head for later. Also, I don’t know where I saw this, but we love MOOC’s and this site – edX – has lots of cool courses coming up and lots of archived ones. You can use them to supplement school, do unit studies with them or take them for credit (some courses offer certificates upon completion for an extra cost, some come with certs at no cost if you pass the class.) For the archived classes you can’t get in on discussions or get a cert (of course), but they are still useful (and if you wanted to count that time for homeschooling, just keep track of the grades and time spent and log it that way.) I’m taking an archived class right now – Effective thinking through mathematics – which is not as scary as it sounds! It’s just using puzzles to create an out of the box thinking method for solving problems, not just math ones. The week is pretty slow, nothing but school for Tues and Wed, then we have a hike, cake decorating at the MCA Fri night and nothing yet for the weekend, but I might find something to do. Water sampling was a bit tricky today due to the snow. I really need to get waders, it’s much safer to go down and cross Marcy gulch rather than cross the bridge and go down the rocks to get to the correct sampling site. There was a whole section that was closed off due to sand, so Grace went a little more toward the right bank to get a sample that had Platte river and Marcy gulch water in it. We saw raccoon and deer tracks in the sand near the banks and the ice on the river upstream looked creepy. More snow on the way out. Back at home it was sample time. The many colors of a dissolved oxygen test. After lunch with James we went sledding at Ruby Hill. I know it’s hard to believe, but we’ve never been sledding there. There were a few bare patches (snow today, gone tomorrow), but it was still fun. For some reason I can’t put videos that were live on here, so click THIS to see me and Hannah racing down the hill at Ruby Hill park. I had forgotten to put the beef stew in the crock pot, so back at home I had Hannah go through her history in the kitchen while I chopped and stirred the stew on the stove. Later Bethany went to Holy Yoga while James and I went to a lecture on the artist Herndon Davis (most famous for the ‘Face on the Barroom floor’ in Central City, but he was much more than just that.) I love the tidbits of Colorado history that we get at events like these, we learned more about Alfred Packer, the Espinosa brothers, Gov. Evans, William Byers, Molly Brown, Soapy Smith, Mattie Silks and many more Colorado people, saw pictures of building that are gone forever, Littleton mill, the first Denver hotel, other downtown buildings and some that have been re-purposed like the old Littleton library (The Melting Pot), a brothel (law offices) and more. Davis painted and drew people (like Douglas Fairbanks, Molly Brown, Soapy Smith and more), buildings (like those in the mural of downtown LIttleton at the RTD station), scenes (like the finding of the Packer crew – or what was left of them, Indian massacres and the reward for the heads of the Espinosa brothers), murals (some are saved, like the one at the Oxford hotel and Crawford hotel) and sketches (some on the walls of a basement in a Denver home.) Dr. Colorado (as he is known, or Tom Noel his real name) did a great lecture and we left with some places to visit and items to read. We did school then the girls went to the coffee shop while I danced. Instead of having a regular devotional we spent time going over the original questions from the beginning of the session and seeing the change that has happened over 11 weeks. There have been a lot of changes in the women in my class, hurdles, hurts, overcoming fear, realizing that we don’t have to check off a box to worship God, tears were shed and hearts were made new. I have said this before, but doing worship dance is not about the dance. Yes, it’s nice to dance and to show others the dance and bring them into worship, but really the time spent in the Word, in devotionals and chewing on the promises of God and getting them into our hearts – that is the real deal. Tonight we had a lecture at Memory Lane. We’d heard part of the lecture before (Women in Denver) but the real reason we wanted to go to it was to see the inside of this place called Memory Lane. It was so cool. Bethany and Grace helped serve ice cream behind the soda counter, we played arcade games, pinball, saw the train set up, looked at memorabilia and saw the old cars. You can’t get into this place unless they have an event (like Active Minds meetings) so I don’t know when we’ll go back, but it was really fun.